Online registration has closed. Tickets are available at the door. 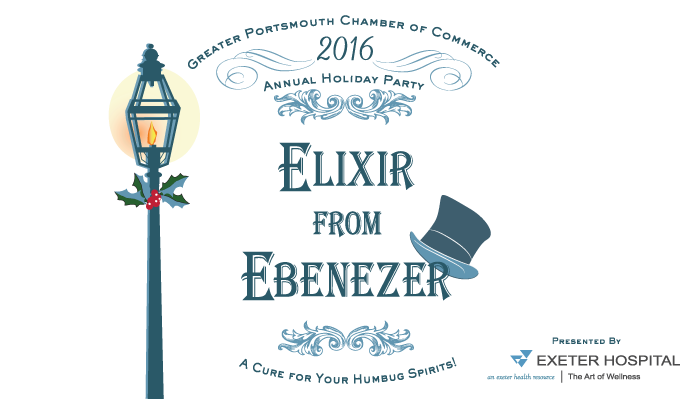 The Greater Portsmouth Chamber of Commerce invites you to celebrate the Holiday season with us at our Annual Holiday Cocktail Party, Elixir From Ebenezer, presented by Exeter Hospital. This festive evening will take place on Wednesday, December 14th from 5:30-7:30 pm at the Sheraton Portsmouth Harborside Hotel. Come ready to mix and mingle with friends and community neighbors as you sample from over 40 varieties of wine, craft beer, and cider, while enjoying Charles Dickens-inspired hors d’oeuvres prepared by the Sheraton’s cutting edge chefs. The winning ticket of our Broadway Bound Raffle will be drawn during the evening, sending two lucky individuals for a trip of a lifetime to see Hamilton on Broadway in New York City.